Act I: La Sylphide takes place in Scotland. James is sitting in an armchair at the fireside at the dawn of the day of his marriage to Effie. Near him a winged spirit, a sylphide, (sylph), appears, gazes at him with love, and wakes him with a kiss. As James wakes up, the sylph runs away, dancing. Effie, her mother, some neighbours, Gurn, (Effie's disappointed suitor), and Madge, (an old witch that James had sent away), arrive. Madge prophesies that Effie is not loved by her betrothed, (James), and will marry Gurn. When he is left alone James sees the sylph again. This time she professes her love for him and invites him to follow her. Gurn has witnessed this and runs to tell Effie, so that she may see James' infidelity. The sylph is in the big chair, but James covers her with his cloak, and when Gurn whips it away the chair appears to be empty. During the party the sylph moves among the dancers, visible only to James. Finally, she takes the wedding ring intended for Effie from his hand and rushes into the forest, with James in pursuit, leaving Effie in tears. Gurn leads the guests in search of James. Act II: The witch Madge is in a dark cave conjuring spells and surrounded by demons. She dips a filmy scarf into the cauldron. Now, in a dense forest, James enters followed by the sylph, with whom he is now in love, even though she continually evades him. Meanwhile Gurn and the others have returned from their search after failing to find James. Madge appears and gives James the scarf "with which he can hold his elusive love." After a couple of tries he succeeds in tricking the sylph and encircling her in the scarf. Immediately her wings fall off, as Madge has cast a spell on the scarf, and the sylph dies. Overcome, James falls to the ground, and in the distance we hear the sounds of the marriage feast of Gurn and Effie, while the witch gloats over her revenge. 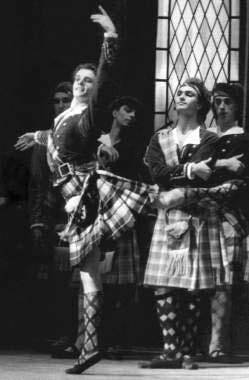 This ballet is set in Scotland, a land that was considered remote and exotic at the time, and was created, for Marie Taglioni to dance the role of the sylph, by her father. However, the version you will probably see today is not the original Taglioni version, it is the newer Bournonville version.